Chittenden County Regional Planning Commission did a nice job of hosting this year's Vermont Walk / Bike Summit. It had only a slight bias towards the more urban areas (as Chapin Spencer noted "Yes, Vermont does have cities with over 5,000 people"), but I did learn a lot about more rural initiatives. 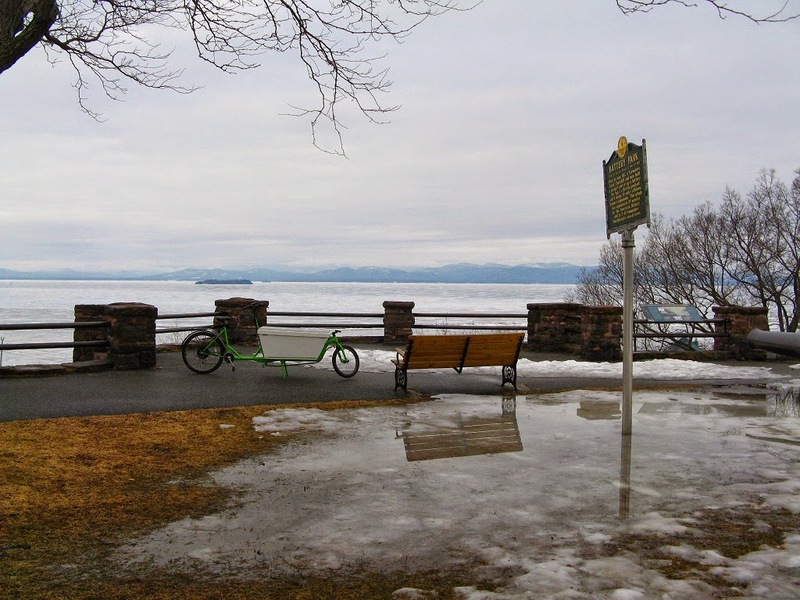 The first thing I did after unloading the bike was a short ride up the hill to look out over Lake Champlain, which is still frozen over. Fortunately it stayed dry the whole day so that activities could go on outside the conference too. This is a good summary of Complete Streets principles, and highly readable. The morning presentation I attended was about intersection and street design, it was good but more for Burlington, I attended mainly because one of the presenters is working on the Hartland 3 Corners (square) redesign in the center of my town. There were also displays from the UVM Transportation Research Center, a few cycling companies, 350.org, Local Motion, and Vermont Bike and Ped coalition. It took a while to absorb the info. This Invacare TopEnd Excelerator XLT Gold handcycle is so hot! The young woman who owned it said that she had knobby tires on it at first for riding on roads around her town, but ended up racing it and putting on racing tires. For those of you who have read my posts about Front Fork Geometry, look at the head tube angle on this! It's shallower than many choppers, but the trail still looks reasonable. Mayor Miro Weinberger stopped in during lunch to give a summary of Burlington's efforts at making the city a more bike and ped friendly place, and then Caroline Samponaro of Transportation Alternatives in NYC gave the keynote address. Even though her experience was urban, it was great to learn more about serious relations with traffic. After lunch I attended fellow cargo bike enthusiast Dave Cohen's presentation about the sensory deprivation caused by cars. He is an ecopsychologist from Brattleboro, and covered the takeover of American streets by automobiles during the early 1900's, and where it has lead our transportation planning today. He summarized the resulting impacts on our lifestyle, and explored using cargo bikes as a car alternative. There were about 200 people attending the conference, and about 60 to 70 of them attended his presentation. 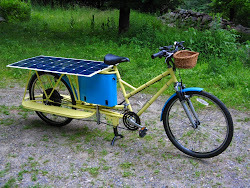 When leaving the lecture many stopped to look at my cargo bike display outside the door. Albert Echt and Deb Sachs stopped to look at the bike. 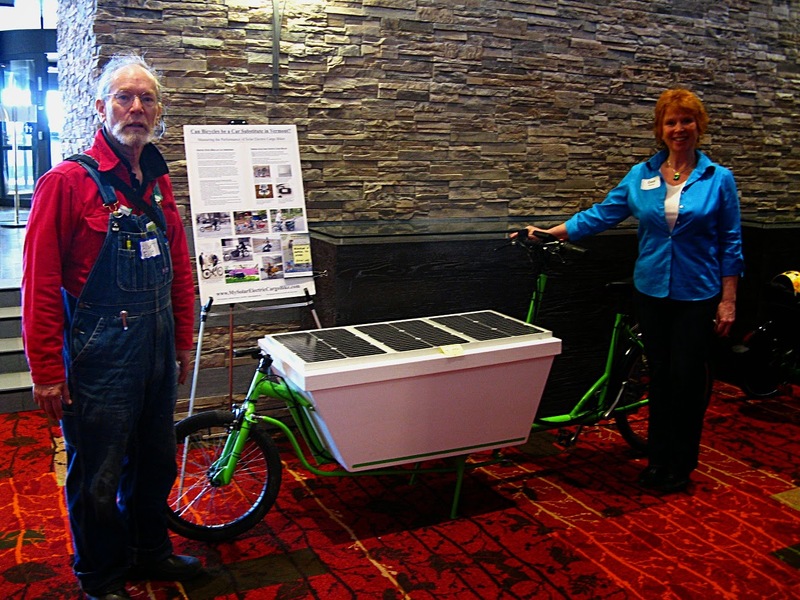 This conference was extra rewarding because there were people there who work on bikes and professionals working on transportation issues, so we also talked about details and practical technical aspects of the solar electric cargo bike. However the real fun came after the conference ended at 5 and we took the bike outside for test rides. Dave Cohen using the electric drive. Ron Manganiello of Bike Recycle Designs covering some ground. 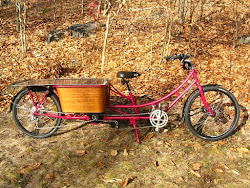 Getting from my town to the next is one of the design goals for this bike, something that most cargo trikes and the ELF won't do as well. Thomas Cohen of Local Motion pulling in after a short ride. On the first ride most people start out slow, but after a minute of getting used to the bike, it handles pretty good. I have to end with this picture, because it is Stuart Lindsay from the Burlington Walk/Bike Council (northwest VT), Dave Cohen from Brattleboro (southeast VT), and me from the center part of the state, all talking utility bicycling. Footnote: There were 6 test rides, and when I recharged the battery the energy usage was 68.8 watt hours for 3.671 miles, which is 18.7 watt hours per mile. This is equivalent to 1765 miles per gallon. I would characterize these test rides as using more energy than an average ride. The Kill A Watt meter measured 0.08 kWh (80 watt hours) to recharge the battery, which at $0.15 residential electricity rate is 1.2 cents worth of electricity. The difference between the Cycle Analyst's tally of 68.8 watt hours and the Kill A Watt's 80 is the efficiency of the charger, which works out to 86%.